When I wrote my series on Breastfeeding, I knew that it wouldn't come off very "crunchy." But that wasn't what I was going for either. I was sharing my experiences and the knowledge that I have gained. I sit on the fence when it comes to living naturally. It is always something I strive for, but I also have to keep a balance and do what I need to do to take care of my family on limited time and resources. We do what we have to do with what we have. 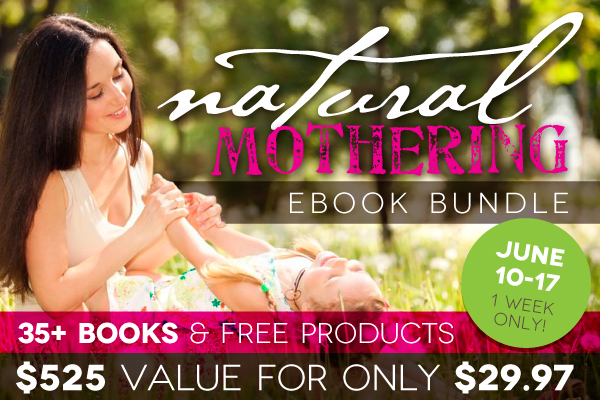 I want to introduce you to an eBook Bundle that is a collection of awesome resources for those of us who want to live a natural lifestyle. It takes all the guess work and research out of the equations so that you can focus on implementing. Many of them are practical guides to balancing it all with your lifestyle. These are just SOME of the freebies! If you have any interest in any of these topics or even just some of the freebies,this price is unbeatable. Please join us on Monday when this sale goes live ~ You won't regret it! For updates on this sale and other informative posts, please consider subscribing.